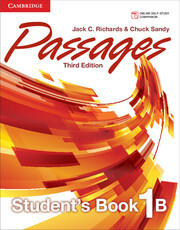 The Passages, Third Edition, Student's Books have been updated to offer fresh, contemporary content, relevant speaking and listening activities, comprehensive grammar and vocabulary support, enhanced reading skills development, and a step-by-step academic writing strand. The Student's Book with Online Workbook B package offers an economical way to provide interactive skills practice, extra listening exercises, helpful progress monitoring tools, and instant feedback, and corresponds to Units 7-12 of the Student's Book. Access to the Online Workbook is provided through an access code printed on a separate card that is shrink-wrapped with the Student's Book.